I’ve always wanted to try a cooking class. I’ve been baking and experimenting in the kitchen since I was little. (Back when I used to do it for fun, before I got stuck into the ‘mom! What’s for dinner?’ routine every night.) Even though day to day cooking can be a bit of a chore as a busy mom, I still love when I get to try something new. I had heard about In Good Taste over a year ago and checked out their website. They had many classes to choose from with different themes: Thai, Spanish, comfort foods, even kids courses and dessert classes. I wrote it down on my mental to-do bucket list then and there. All of our lucky stars must have fallen into the right alignment, because low and behold we had a date night. My father was in town for Emma’s graduation and I convinced him that it would be a wonderful early birthday present to babysit for me. The class started at 6:30pm and we were warned it was hands on – meaning bring your apron. We arrived and were greeted with a lovely glass of sparkling champagne and seated. It was an intimate class of nine students, the chef, and two sous chefs. We all sat semi-circle around a bar with out place settings and pamphlet of recipes for the evening. The chef introduced himself while we sipped our bubbly and were served bruschetta. He explained what to expect for the evening and with his Brazilian accent and sense of humor I knew we were bound to have a good time. We split into groups and quickly began. The chef showed us what to do and gave some great pointers. I had know idea that for the past twenty years of my life I had been cutting onions wrong! No joke! The way he showed us was so simple, and there were no burning or watery eyes in the building! 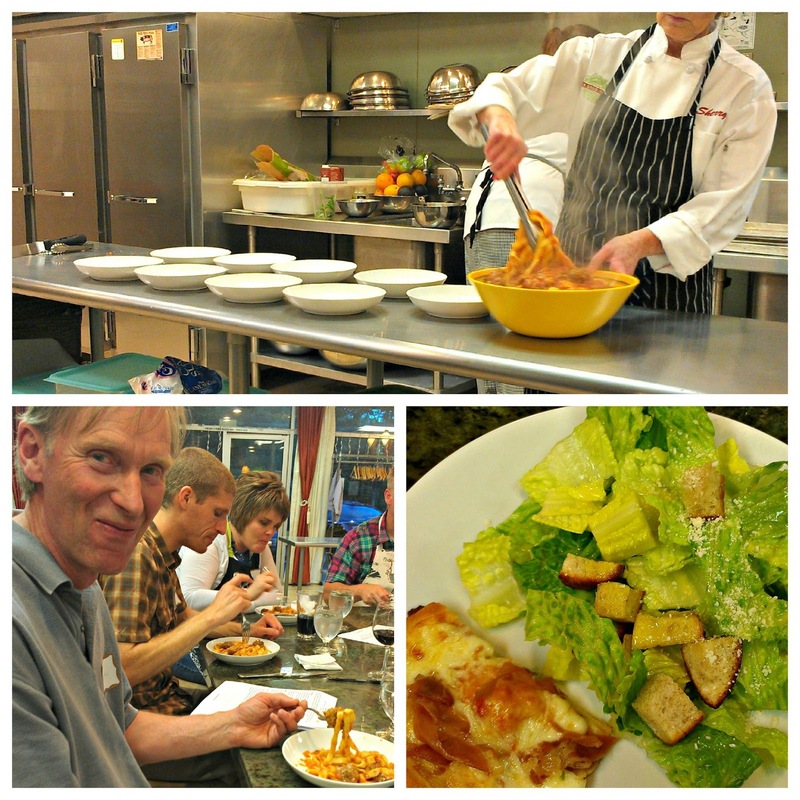 While the pizza baked we whipped up a Caesar salad and watched how to make Calamari Fritti. 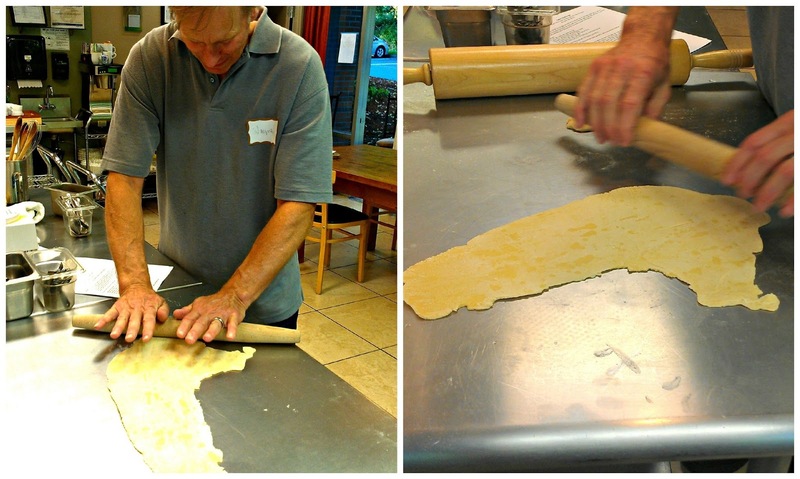 Next we attempted to make our own homemade pasta. Ours accidentally got a little too much flour mixed in and didn’t look so pretty! Everyone else’s turned out fabulous, and well, somehow ours ended up in the shape of Italy! We all burst into laughter at the site of it! As the cooking frenzy came to an end we gathered back to our seats and were greeted with glasses of Pinot Grigio and the calamari to nibble on while they dished up our pizza and salads. The Chef kept us all very entertained with many stories from living all over the world, and we all had great conversation of delicious foods from around the country. I now have another thing to add onto my must try bucket list. Brazilian stroganoff. No joke. It’s made with fillet Mignon and sounds amazing. Next the Polpetti and Pomodoro was served with glasses of Pinot Noir, and we all enjoyed the flavors of our hard work. And last but not least the chef had prepared the grand finale for us: tiramisu. The best tiramisu I have ate in my life, hands down. Lucky for me I now have his recipe. I’ve already informed my husband that I want this instead of birthday cake this weekend! We wrapped up the night with coffee and a few more stories from the chef. He had us daydreaming of life in Brazil, France, Italy and New York. This was such a wonderful alternative idea for a date night. Rather than just dinner and a movie, we helped create this magnificent feast, met some new people, and learned some great techniques. Now I’ve been looking at their website and seeing which other courses I can put on my wish list…and who knows? Maybe next time it will be girl’s night out! 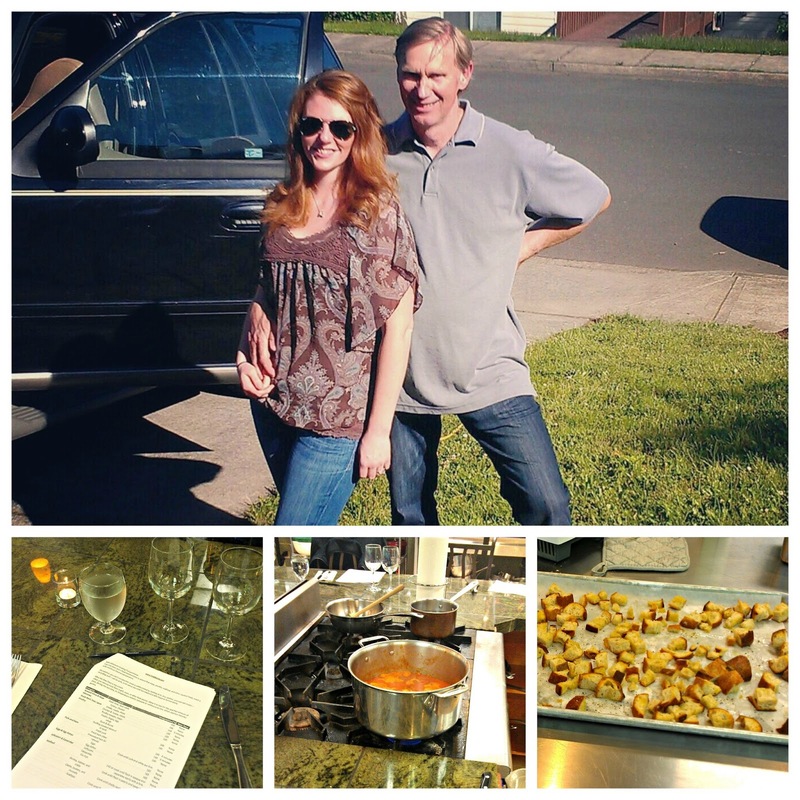 Full Disclosure: In Good Taste PDX gave me a complimentary cooking class in exchange for my review. This review and all opinions are my own. Brava! 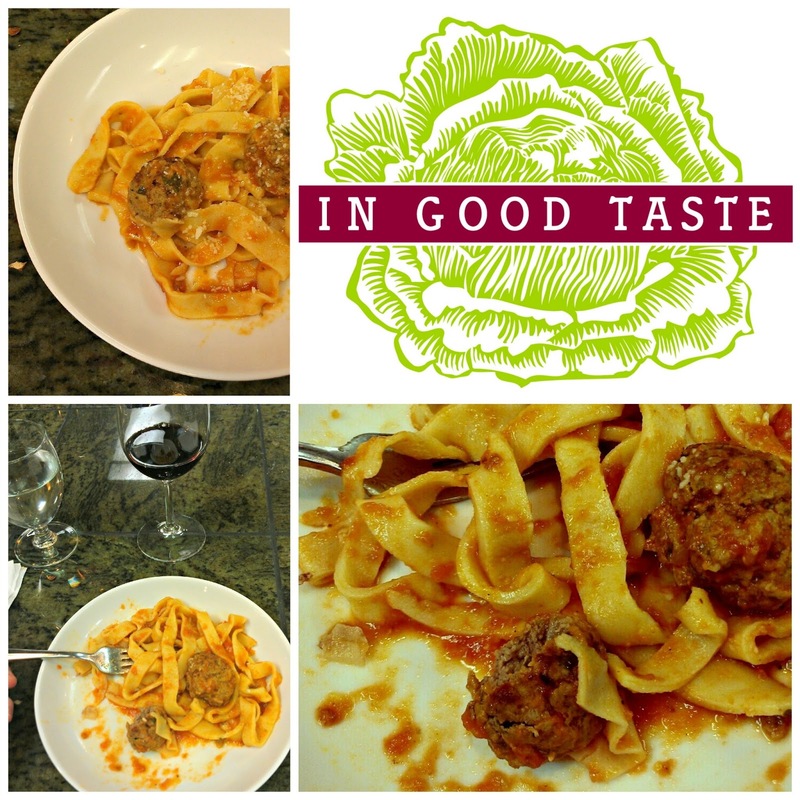 I have been hosting Francesca's Cooking Club for a number of years at In Good Taste with Chef Pianucci and agree with all your comments. Great food, laughter, joy and wonderful experiences with good friends. I am Italian, traveled all over the world and know the simple things are what makes it all worth while. Wonderful! Sounds so exciting! With all that wine, I'm not surprised your noodles got a little too much flour! LOL I'm dying to know how to chop those onions, though! I LOVE stroganoff! You'll have to let us know how that tastes whenever you get the chance! Stopping by from the Bloglovin' Collective Blog Hop. Wow! That looks like a really fun night. How cool! What an awesome way for you to spend time together. I'm so glad you had the opportunity. What a fun idea! I'd love to do something like this with my guy. Great alternative to movie night on the couch. WOW!!! Soooo much fun! And, yes, my mouth is watering. You've inspired me. Going to see if there is a class in my area. This looks amazing! I totally want to try this out. Looks like you guys had sooo much fun. Maybe I should get a group of friends together and have a fun cooking night. What a great idea! Fun and yummy!!! Thanks for sharing at Monday Funday Link Party!! This is a lovely idea! I live in San Antonio where there seems to be a lot of cooking clubs and classes going around. I still need to convince hubby to come with me :). Thanks so much for sharing date night with us @ My Favorite Posts SHOW OFF Weekend Blog Party! 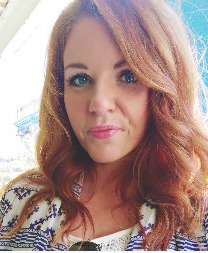 Thanks so much for sharing your date night post at the Say G’day Saturday linky party. It looks like you had a fantastic time! It looks like you had so much fun! What a great idea for a date night – thanks so much for sharing!